Rub pork chops with salt and pepper. In 12-inch nonstick skillet, melt 2 tablespoons of the butter over medium-high heat. Add pork; cook 6 to 7 minutes or until browned on first side. Turn pork; reduce heat to medium, and continue to cook 4 to 5 minutes longer or until pork is no longer pink in center (at least 145°F). Transfer to plate; cover with foil to keep warm. In same skillet, melt remaining 1 tablespoon butter over medium-high heat. Add onion and corn; cook 3 to 4 minutes or until onion softens and begins to brown. Remove from heat; add whiskey, and return to heat. Cook 1 to 2 minutes over medium-high heat until whiskey evaporates. Stir in lemon juice. Pour corn mixture over pork. Sprinkle with basil. We tested this recipe with bourbon, but Irish whiskey would be delicious as well. 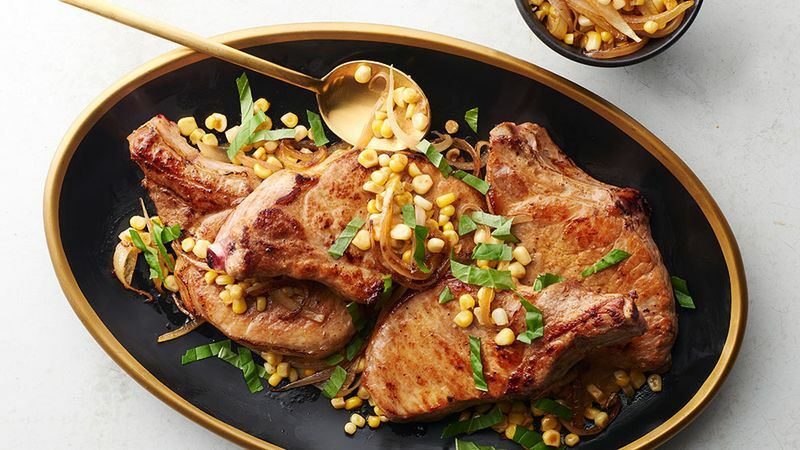 Feel free to sub different types of pork chops in this recipe. Just be sure to adjust the cooking time accordingly, depending on thickness, so pork reaches an internal temperature of 145°F.